Mary Slevin Sax EBM Interesting start to the album, the first track 'Mad Wights' bears resemblance to Faithless' 'We come one', curiosity is awakened. Human Decay themselves state that they intentionally seek to mix and match between genres. This could either be a catastrophe - resulting in an album with highs and lows but no depth OR it could just be genius - say 'Credit to Humanity' falls in the latter category. 'Dolls' reeks of old Prodigy and Ohgr, with it's rap-talk-singing and vocoded samples, it twist and turns and makes for a real head banging track. It can't be described as anything but brave to break of the first three track with the fourth 'Endless', an instrumental soothing session. It's unexpected and works surprisingly well, like having sorbet before the next course at a fancy restaurant. 'Silent submission' brings me back to the feet stomp and leaves me with a pleasurable ominous mood before entering the dance floor with the future pop dance hit 'Alienate'. Sometimes instrumental pieces on albums tend to fall behind the tracks with singing, on 'Credit to Humanity' the music itself has so many layers and such a depth that the instrumental tracks like 'Black Sheep' and 'Follow Me' are right up there earning their place like the rest of the tracks. Interesting start to the album, the first track 'Mad Wights' bears resemblance to Faithless' 'We come one', curiosity is awakened. Human Decay themselves state that they intentionally seek to mix and match between genres. This could either be a catastrophe - resulting in an album with highs and lows but no depth OR it could just be genius - say 'Credit to Humanity' falls in the latter category. 'Dolls' reeks of old Prodigy and Ohgr, with it's rap-talk-singing and vocoded samples, it twist and turns and makes for a real head banging track. The album keeps me interested all through which is exiting and unusual. 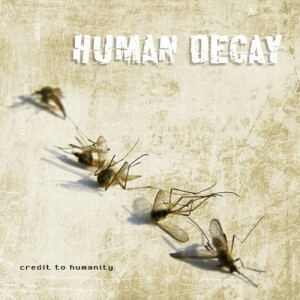 The tracks are very individual but the album is solid, I'll be lucky if there's anything else close to this kind of quality released in 2012. Credit to Human Decay.